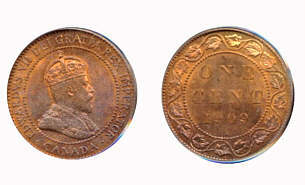 The Edward VII Canadian Penny was struck by the Royal Canadian Mint from 1902 to 1911. The designer of this coin was George William de Saulles. The value is approx. the average price with which US dealers sell these coins. The values depend very strongly on the grade of the coins. If the grade is better than xf the coin could be worth much more!